Gustavo Turecki collaborated on groundbreaking work in epigenetics linking childhood trauma and the likelihood of adult suicide. According to a panel of experts carefully assembled by Québec Science magazine, three of the Top 10 scientific discoveries of 2009 were achieved by McGill scientists, in collaboration with researchers from the Jewish General Hospital Lady Davis Institute for Medical Research and the Douglas Mental Health University Institute. The institutions and the researchers themselves are naturally very proud to be recognized this way. 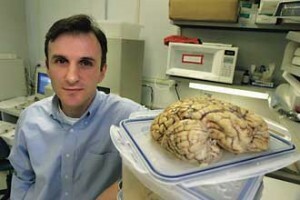 Patrick McGowan, Michael Meaney, Moshe Szyf, and Gustavo Turecki, as part of a wider research team associated with McGill and the Douglas Mental Health University Institute, determined that childhood trauma alters DNA and shapes the way genes work, seriously affecting the likelihood of suicide in adult life. Although DNA is inherited and is uniform throughout the body, DNA genes are marked by a chemical coating called DNA methylation. These markings punctuate the DNA and modify the way genes are expressed. It is these marking that are sensitive to the individual’s environment. In 2004, Meaney and Szyf collaborated on a ground-breaking study that proved the epigenetic marks of lab rats were affected by simple maternal behaviour, such as a mother licking her pups. Regular grooming brought about a chemical change in the mechanism that regulates stress hormones in the brains of rat pups – a change that persisted into adulthood. Expanding on this, research conducted through the study of the brain tissue and personal lives of suicide victims showed that the same phenomenon exists in human beings. form the basis for individual differences in vulnerability for illness in later life. Indeed, the “putting together” of a wide variety of factors is an innovative approach in their field, and can be cited as a major reason for their success. Talk about an illuminating discovery. Research into the physical laws of how to generate and amplify light conducted by McGill professor Patanjali (Pat) Kambhampati and collaborators could lead to major gains in lighting efficiency, no small matter considering room lighting is responsible for 20 per cent of energy consumption in the world. As well, the research could create the hardware for the Internet of the future – hardware that is faster, cheaper, greener and less expensive to operate. The discovery by Kambhampati and his colleagues, doctoral students Ryan Cooney, Sam Sewall and post-doctoral student D.M. Sagar, will have an effect on the way in which researchers design materials and devices which generate, amplify and control light. The ability to perform these operations is at the heart of many technologies from light emitting diodes to lasers for telecommunications. These technologies are further advanced by the new science of materials on the nanometer length scale, or nanotechnology. “Our discovery is less about a specific application and more about establishing the design principles for investigating nanoscale materials for creating and controlling light,” said Kambhampati. “In our first test, we found that most of the last decade of work on this subject was, in fact, wrong. Our aim is to use our design principles to guide the exploration, development, and implementation of nanoscale materials into many classes of light-based devices from LEDs to lasers. often diagnosed in young adults, aged 15 to 40, it also affects children. MS is unpredictable, causes loss of vision, hearing, memory, balance and mobility. Canada has one of the highest rates of MS in the world. Every day, three Canadians receive a diagnosis of the disease. But amid the bad news there is hope. reverses the autoimmune disorder in mice and has the potential to work in the same manner in humans. When one suffers from MS, their body’s immune system attacks the central nervous system – as though the body is allergic to itself, leading to progressive physical and cognitive disability. The new treatment, named GIFT15, puts MS into remission by suppressing the immune response. But, unlike earlier immune-suppressing therapies which relied on chemical pharmaceuticals, GIFT15 is a personalized form of cellular therapy that utilizes the body’s own cells to suppress immunity in a much more targeted way. GIFT15 is composed of two proteins, GSM-CSF and interleukin-15, fused together artificially in the lab. Under normal circumstances, the individual proteins usually act to stimulate the immune system, but in their fused form, the equation reverses itself. “GIFT15 is a new protein hormone composed of two distinct proteins, and when they’re stuck together they lead to a completely unexpected biological effect,” said Galipeau. This effect converts B-cells – a common form of white blood cell normally involved in immune response – into powerful immune-suppressive cells. Unlike their better-known cousins, T-cells, naturally occurring, immune-suppressing B-cells are almost unknown in nature and the notion of using them to control immunity is very new. The team’s discovery may also pave the way for gains against other autoimmune disorders such as Crohn’s disease, lupus and arthritis, and could also control immune responses in organ transplant patients.